In order to meet the requirements of the most demanding high-speed imaging applications a balance of high frame rate, image resolution, dynamic range and light sensitivity is required. The FASTCAM SA-X2 high-speed camera system has been designed to provide a careful balance of these requirements. FASTCAM SA-X2 brings together unique CMOS image sensor technologies and digital imaging expertise to provide optimum imaging performance. The system offers recording rates up to 13,500fps at megapixel image resolution with 12-bit dynamic range and high image quality. Frame rates greater than 1 million fps are available at reduced image resolution with shutter speeds as short as 293 nanoseconds (export restrictions may apply). Light sensitivity is often the most critical performance criteria in high speed imaging. Without high light sensitivity, imaging at high frame rates with short exposure times is not possible. A camera system providing high light sensitivity allows a wide range of objective lenses and lighting techniques to be optimized to visualize complex high-speed phenomena. The FASTCAM SA-X2 system may be controlled over a high-speed Gigabit Ethernet network or via the optional keypad. 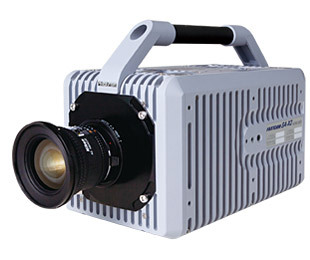 Standard operational features of the FASTCAM SA-X2 include a mechanical shutter to allow remote system calibration, dual-channel Gigabit Ethernet Interface for fast image download, and internal memory card drives allowing image download and storage to low cost removable recording media. The system also features memory segmentation to allow recording in one memory partition while at the same time downloading a previous recording, and the ability to remotely switch off cooling fans to eliminate vibration when recording at high magnifications. The system is supplied with intuitive and feature rich Photron FASTCAM Viewer (PFV) software and Photron Device Control SDK (software development kit) allowing integration with user specific software. Alternatively the camera can be controlled as a device within a MATLAB ® or LabVIEW environment.